It is with great sadness I farewell an old friend today; my trusty backpack which has carried many a load in its time, been to a hell of a lot of amazing places, been pivotal in some truly hilarious tales. It was a humble beginning in 2003, purchased in the January Kathmandu sale for a shoe string RTW jaunt. Cheap as you were we saw Canada, England, Wales, Scotland, Ireland, Northern Ireland, Spain, France, Italy, Germany, Switzerland and Greece on that trip; good times. Briefly stored away at the back of a cupboard when I came back to Australia to get a ‘real job’, it wasn’t long before we hit the road again, traveling through Thailand and Malaysia to Singapore in 2005, then checking out Bali and Lombok in 2006. Study kept us grounded in Aus in 2007 but we fled to the tropical paradises of Fiji and Samoa in 2008, followed by chilly Canada again in 2009 via the USA east coast. It was in the South Pacific that the first little cracks began to appear, your straps being tied together with rope at some point, but it didn’t seem like anything to worry about. But then 2012 came with the opportunity for an epic 4 month adventure in India. I questioned whether you would make it, especially when a client sent me a spunky new generation backpack, the kind with straps AND wheels. But I didn’t want spunky as much as I wanted reliable and I knew you had it in you. We traveled both north and south, east and west, as well as a side trip to Sri Lanka, and you held it together to the end, though no doubt the fraying and disintegration had taken its toll. I got you back home onto Australian soil but as I unpacked you that last time my belongings all came out covered by the flaking lining of your insides… I knew we had reached the end. 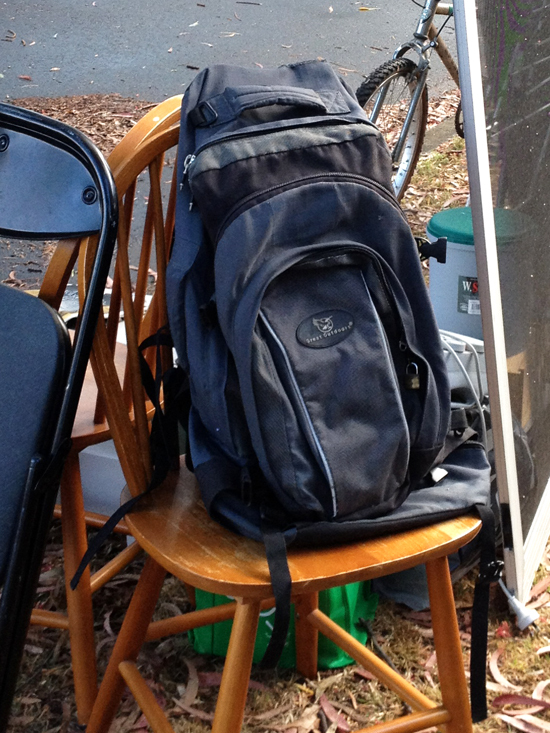 My trusty backpack, discarded on a street collection pile ready to embark on his final (…sob…) adventure.